Organizations, like people, develop. A start-up has different organization qualities than a 25-year-old, Fortune 500 company. As operations increase in scale and scope a start-up faces new pressures. Each increase in production, staffing, or market share increases their operating risk. What worked as a start-up company with a staff of 5 and $500,000 in revenues can no longer manage the same way with a staff of 85 and $2.5 million in revenues. Merely doubling the numbers, however, risks compounding the challenge of planned, intentional human capital growth to meet financial and intellectual capacity. Frustration over organization culture, values, and communication many times comes down to values and interpretations: enter the Myers-Briggs Type Indicator (MBTI) assessments that seem the rage. The MBTI assessment focus on the individual and the individual to convey and manage both themselves and others from their assessment framework. For maximum effect there is a need to manage your MB filter and also know the MB profile of each person to manage other’s MB filter need – I believe this is too much to rely on people to communicate in all conditions. I have also found little proof that an MBTI assessment provides actionable, sustained results for teams, operations, or improved communication with others. The most repeatable observation I see from an MBTI assessment is the initial excitement to share an MBTI profile result – akin to sharing a zodiac sign and as useful as a zodiac sign to develop and drive organization effectiveness. I find the MBTI is not nearly as valuable as the Competing Values Framework for a results-oriented assessment. This is less about what MBTI really delivers and more about what MBTI has become within many conversations and organizations. Mismanagement of any tool that misses the ‘So What?’ filter between people and teams is less a fault of the tool and more fault of the facilitator as well as leader to not make that connect. Alternatively, the Competing Values Framework is an early-level assessment I rely on to help an organization understand their culture and the real gap between strategic, operation, and functional alignment. Competing values are important to understand effective performance. People are often recruited to manage within corporate value and demands; too often termed: culture. But what happens as a company grows? Not all people can manage in the new environment demands. Many wish for the old days and refuse or can not change. Organizations that understand change can train and manage and cultivate people who grow with the organization and help those that don’t find a match for their style. Managing people out is always an easier conversation than hanging on hoping they will change or managing them with sensitive gloves. In the below 4 x 4 matrix are the 4 values, Ad Hoc in the upper right-hand. 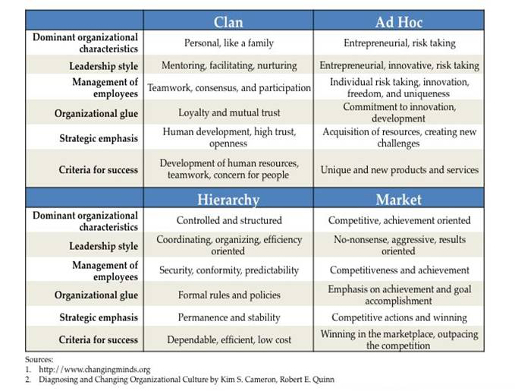 A typical organization progression is a move from the upper right to upper left: from Ad Hoc to Clan; then from upper left to lower left: from Clan to Hierarchy; and finally from lower left to lower right: from Hierarchy to Market. Though companies need never move in this counter-clockwise progression as they mature and may stand firmly in one quadrant. **Note: this is not a matrix describing optimum, operating efficiency or to suggest all organizations aspire to the lower, left, Market quadrant. The Ad Hoc organization is built to manage a rapidly changing climate. The Ad Hoc culture values speed and adaptability and can rapidly form teams to prototype and experiment. Ad Hoc environments are dynamic, entrepreneurial, and creative focused on rapid growth and acquiring resources. Ad Hoc leaders are visionary, innovative, take calculated risks to make significant gains. The Clan organization has less focus on structure and control and a greater desire to maintain flexibility. People in Clan organizations are driven by vision, shared goals, and outcomes and less by strict rules and procedures. Clans have a sense of family where people work well together because of a strong loyalty to one another and the shared cause. Rules, although not necessarily documented, exist and are often socially communicated and heavily enforced. Clan leaders are usually facilitative, supportive, and act in a parental role. The Hierarchy has a traditional approach to structure and control from a strict chain of command, best described through Max Weber‘s original view of bureaucracy. Hierarchies respect organization position and power. These organizations rely on well-defined policies, processes, and procedures. Leaders of Hierarchies are coordinators, organizers, and deeply monitor what is happening. The Market organization seeks control, similar to Hierarchy. The Market organization is not focused just on marketing, but by all transactions, internal and external, as exchanges of value. Market cultures are results driven and often highly competitive work places. Leaders in market cultures are often hard-driving competitors who seek always to deliver the goods. So now values can be identified, what can be done? Organizational Culture Assessment Instrument (OCAI) assessment survey provides the Competing Values Survey score and can find out where your employees are at. The survey also identifies you to your team; to your department; and to your company — as desired. Imagine your CEO operating in a Clan environment while your executive team operates in a Hierarchy environment, the disconnect is obvious. Once an assessment is understood, training, job description roles & responsibilities, recruiting, rewards, and strategic alignment can be evaluated and modified. Strategically, discussions can begin on the values to retain, the values to adopt, and the values no longer applicable. The key for me in my use of the Competing Values assessment is to increase organization awareness of risk management. As an organization moves from Ad Hoc to other stages how they identify, manage, and mitigate risk is a key factor for their sustained success within constant change. When you look at a decade of 50% turnover of the Fortune 500, those companies resistant to change are shown a pasture called irrelevant. This is great. I love your focus on risk and no-nonsense, drowned out (often) by management and leadership efficiency attempts. I am one month into my new management consulting co, and I feel I can finally focus on calculated risk and real client service concern. Found this via your new post on organizational culture eating strategy for lunch. I’m pleased you find the post of value. Over the past 15 plus years I’ve been driven by feeling that if I am to have a seat at the business table, I need to speak in business terms: risk, return, revenue, performance. If I can’t frame the challenge in business terms or the opportunity in business terms, I don’t deserve to be at the table. I developed this sensitivity in my marketing career, where would see innovative ideas with out any financial or data driven rigor. Even if your data is not 100% accurate, just by going through a risk/return effort you are many steps ahead. Certainly no CFO wants to hear an idea that can not be assessed against their other options and if I can’t make a case in the business environment, I don’t deserve to be heard. The past 10 years, I’ve worked heavily in talent and organization development. I find the role of human resources and talent management as a business partner only if human resources (human capital) becomes a revenue drive, not a cost center it so traditionally has found itself. Human resource professionals are responsible to understand the mechanisms of business, if they are not at the business table, it their own fault. Good luck in consulting, it is a great profession and a great chance to really look across industry and draw value from a host of the most demanding clients with the most demanding issues. It can be a selfless role, but knowing your client succeeds and you’ve provided something sustainable is very satisfying. I look forward to following your thoughts on Twitter now that I’ve discovered you. It’s great that you to added a comment Torbjorn, thanks.